Working in healthcare, I consistently encounter processes and care offerings that are very rigid and don’t match up with the individual needs and values that patients have. Commonly, I hear stories about patients not feeling heard or respected by clinicians because what is recommended to them doesn’t align with who they are and what they believe. A lot of these issues stem from the fact that, in medicine, people are traditionally triaged and cataloged by medical condition and/or need. While identifying and understanding the medical needs of an individual is obviously crucial in effectively treating a collection of conditions, it is rather limiting as a means of capturing who a patient is as a person. A whole patient understanding is crucial. Quite simply, people don’t perceive themselves as a collection of conditions. Health is personal, intertwined with people’s individual perceptions and mindsets, with the environments in which they live and work and the people with whom they interact. While the notion of understanding people as people perhaps appears obvious, health systems still struggle to identify what information should be captured to understand a patient holistically, and how best to engage a patient in a conversation that uncovers this information. This gap leads to misalignment between the patient and care provider, which in turn leads to poor clinical outcomes and negative patient experiences. With discussion in the industry about patient experience and the surrounding reimbursement challenges, it’s worth thinking about how healthcare might consider the whole person to deliver a better experience, geared toward positive outcomes. What is a “whole person understanding” of a patient? To succeed in providing health services centered around a patient, providers must meet patients where they are: functionally, emotionally, and socially. They must understand the values their patients hold, based on their makeup as a whole. When we talk to people about how they perceive their health, they commonly describe it as a whole, inclusive of their mental state, family, and beliefs. I was part of work completed at the Mayo Clinic's Center for Innovation which supports these findings that a holistic understanding of a patient is made up of many layers. Graphic from Patient Type Research, completed by Meredith Dezutter, Mathew Jordan, and Kate Dudgeon on behalf of Mayo Clinic’s Center for Innovation. At the core of every patient is his or her medical condition or need: heart disease, pregnancy, stage 3 breast cancer, or maybe weight loss. What’s important to note here is that if an individual has a number of health issues, he or she perceives their medical needs as a whole and interconnected. The individual is not focused on singular diseases, as perhaps a specialized clinician might be. From minor to major, the medical or health-related need is what defines the care request and clinical interaction. One of the individuals we spoke to as part of this work had suffered a debilitating fall, which left her with multiple medical and neurological issues. She felt that none of the physicians would take the time to sit down with her and come up with a holistic strategy. Her health issues were looked at “as one-offs, not as a whole person,” which led to disjointed and disconnected care. Layered atop the medical is the psychosocial state: the mental and emotional state, social system, and functional capabilities of a patient. Does this person suffer from anxiety? Is he or she depressed? Does this person’s social support network and environment foster a positive psychosocial state? Another component of a whole patient is one’s attitudes and beliefs, which break into two parts. First are the beliefs or perceptions one has formed over time regarding one’s health and care. These beliefs are often based on the individual’s own experiences or those of family and friends. People will often share about an overly positive or negative experience receiving care. For example, someone might recount waiting five hours at a certain emergency department (ED), or how his mother died after a failed regiment of a certain type of cancer treatment. Frequently, these negative experiences transform into vows to never return to a particular facility, or to never have a certain treatment, despite the fact that the facility may be widely regarded in a positive light or the treatment may be the best option for the patient. 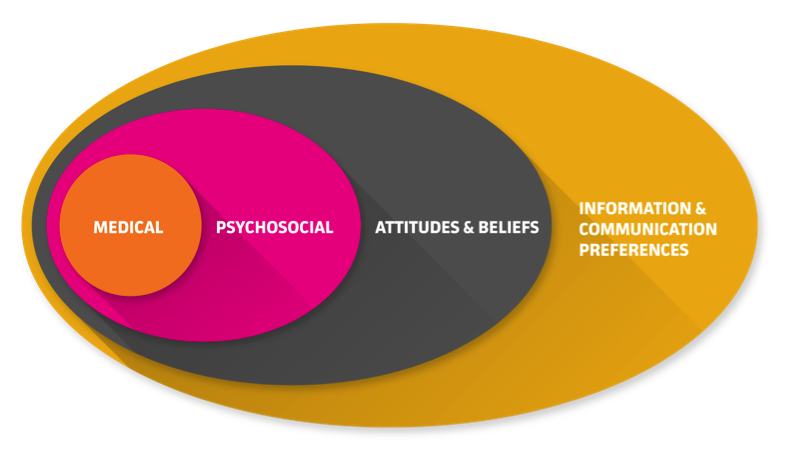 The second part is the attitudinal category one falls into, which depends largely on how much involvement the individual has in his or her own health and care. A minimalist might be someone who denies a health condition or does the bare minimum recommended by a health care provider. A maximalist, on the other hand, might be someone who proactively seeks health information and is engaged in her own care planning. The attitudinal category one falls into is linked to an individual’s personal experiences or those of family and friends. This category will inevitably change over time, as one is exposed to new such experiences. The last component that makes up a whole patient is information and communication preferences: how someone learns, when someone is open to learning, how someone seeks out information, and how someone prefers to exchange information with a care team. For example, we have found a growing preference among people to email or message their doctor when they encounter a health question rather than initially scheduling an appointment, as it provides a quick and convenient response to their discrete need. Some will go as far as seeking out care teams that offer email or messaging services, or other communication methods that they value and use. As these layers are added, a clearer, more complete picture of a patient’s unique values will start to emerge. The differences in the makeup of the layers highlights that—while the medical prognosis may be the same across two patients—the delivery of care, proposed care plan, and manner in which the care plan is communicated could be vastly different to best align with who those two individuals are. Without a whole patient understanding comes misalignment. Otherwise manageable chronic conditions will continue to spiral out of control when a patient’s denial attitude towards their health isn’t identified and supported through coaching. Otherwise straightforward heart procedures will result in continued hospital readmissions when a poor home life is not identified, or an unsupportive spouse who encourages frequent fast food meals is not educated alongside the patient, throughout the full course of a procedure. The model of healthcare will continue to be reactive, rather than proactive, if health systems aren’t set up to holistically understand and support patients. Truly understanding patients is complex work, but focusing on them as multi-faceted individuals will enable the design and delivery of people-centered care and service offerings. Gone should be the days of patients feeling unheard or seen as a number, because it is possible to meet individual people where they are holistically: emotionally as well as medically. Models such as this one can be used as a tool to start. The process begins by recognizing the four layers to a patient and using them as a template, first to guide information-gathering from patients, and then to design the right solutions and appropriate care paths custom to the individual patient.